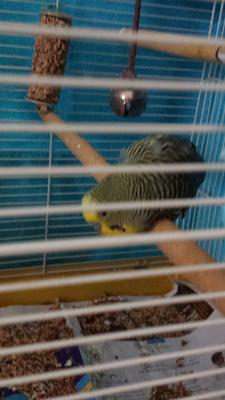 My mom's parakeet is about 7 years old. very playful and chatty. About a week ago, she noticed he began to sleep slouched over on his perch. He is fluffy, shakes and is now sitting on the bottom of his cage. He is eating and drinking, but uses his beak to climb to his perch. It sounds as if your mother’s parakeet is suffering from a condition that is making him weak. The list of possible causes is quite long and includes infections (bacterial, fungal, or viral), nutritional disorders, metabolic diseases (e.g., diabetes), immune disorders, cancer, trauma, and more. I recommend that you get him in to see a veterinarian who specializes in avian medicine as soon as possible. If your mother doesn’t already have a “bird doctor,” use the Find a Vet function on the Association of Avian Veterinarians website to locate one nearby. In the meantime, thoroughly sanitize everything in the bird’s cage and keep it impeccably clean. Provide fresh water every day. Replace his food with a new batch of his favorite type (pellets are better than seeds but this is not the time to make a diet change). Make sure the cage is in a draft-free location and warmed to around 83 to 86 degrees Fahrenheit.